In the Alert rules tree, select the alert you want to configure. In the Alert rules tree, click Time. Select an existing time and click Edit, or click New to create a new time filter. In the Filter edit dialog box, enter data in the fields (described below). Filter name: the identifying name for the filter. 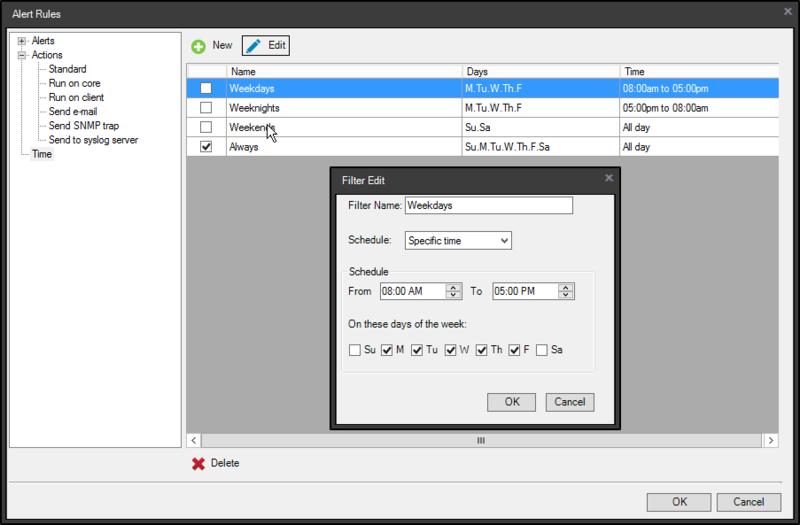 Schedule: select Specific time for a filter that limits the time and days when the alert is monitored. Select Anytime to monitor the alert continually. From and To: select a beginning and ending time during the day when the alert is monitored. On these days of the week: select the days that you want the alert monitored.